Then Economics Association President Micah Herman presents a certificate of appreciation to Mira Farka, associate professor of economics. From government agencies to universities to Fortune 500 companies, economics graduates are at the forefront of understanding and planning for the changes transforming the business world and identifying and solving social problems. 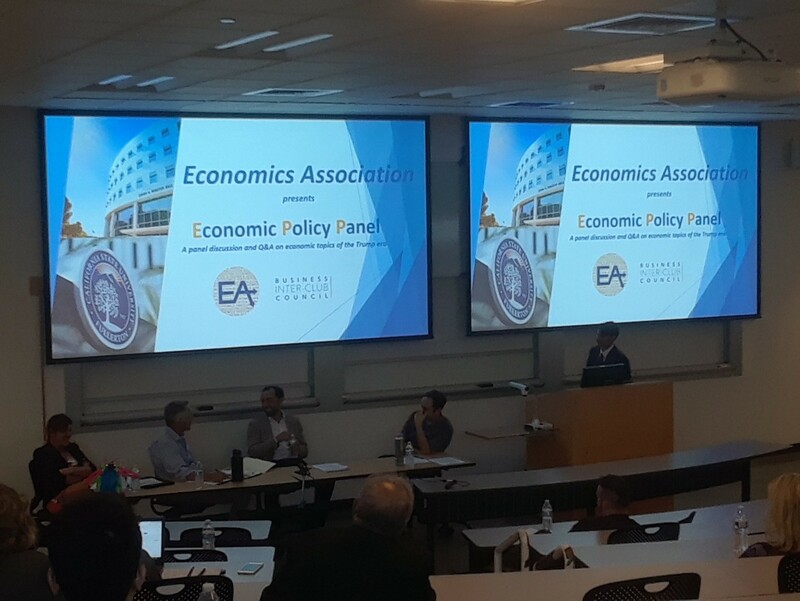 The Cal State Fullerton Economics Association (EA) gives students of all majors an opportunity to network with economists, explore opportunities in the field and discuss the latest trends impacting the real world. Among the club’s sponsored events this week are a data analyst panel webinar at 5 p.m. on Wednesday, Sept. 26, at Pollak Library 440; a networking event with Deloitte Consutling on Thursday, Sept. 27, at 4 p.m. in LH 320; and a tutorial on basic R programming with Assistant Economics Professor Nick Huntington-Klein on Friday, Sept. 28, at 1 p.m. in UH 336. Each semester, many members participate in a lecture series hosted by Huntington-Klein, providing a digestible preview of economics research. Speakers in September included USC Associate Economics Professor Paulina Oliva, who discussed the impact of pollution on migration in China; Joel David, assistant economics professor at USC, who examined risk-adjusted capital allocation and misallocation; and UCLA Assistant Professor of Economics Saki Bigio, who discussed credit, money, interest and prices. The next visiting lecturer, Associate Professor of Economics Scott Cunningham of Baylor University, will discuss the economics impact of crime and high-risk sexual behavior. Micah Herman ’18 (economics), the association’s president during the 2017-2018 academic year, discusses the organization’s mission and activities and why students should consider a future in economics. What are some of the ways that students can get involved in the EA and how does this impact their broader professional and academic goals? The association’s main goal is to maximize our members’ benefit, just as economists are meant to do. Economics is a very broad field, so we have a broad range of events and topics to meet the needs and goals of our members. For our academically-focused students, we have article discussions, talks with notable professors and research collaboration. For our students focused on entering the job market after graduation, we have talks with alumni who have found success in their field because of their economics background. Regardless of our goals, we have a shared niche common interest. Economics is far from the most popular Mihaylo major or focus, but we are all very passionate about it. We love to share that passion. And the best part is that we create a strong network along the way. While CSUF Economics Association students have different career and personal goals, they share a passion for understanding how the economy works and using this knowledge to benefit society. Why should students study economics? What are some of the career opportunities in this field and why is it a rewarding path? Econ is unique, because most jobs that economists get hired for don’t have the word “economist” in the title. Instead, economics gives you a broad range of qualitative and quantitative skills that are hugely valuable in so many fields in the current job market. Personally, my favorite part of economics is data and statistics, so to further back up my case, I’ll give this statistic: Economics is the highest paying non-engineering major, according to the most recent studies. Another reason I love economics and why everyone should major in it is because it allows for so much abstract thinking and, dare I say, creativity, as compared to other business studies because it is a social science at its core. Our professors research whatever they want. For example, because I am aiming for a job in analytics for the video game industry, I wrote my research methods paper on quantifying gender discrimination in the video game market. Now, I am doing my capstone paper on the effect of a major change in the economy of the online game Runescape. Virtually anything can be analyzed with an economic eye. There is a lot of confusion about what economics is. People think that it is all about money and finance. Economics is about resources, efficiency and how we as humans deal with those things. It can be applied to almost anything. Econ is fun. Why do you choose economics and where do you see your career in the future? I chose economics mainly because I was good at it. I took ECON 201 – Principles of Microeconomics with Dr. Farka, who I’m now working for at the Woods Center, and found that it clicked with me. I decided to switch my major from marketing to economics when I did some research and found that I can get into the video game industry with an econ degree, which has been my goal since I was in junior high. In the next five years, I see myself getting paid to analyze video game player data and consulting with developers on game design and balancing. To get involved in EA, or for information on their upcoming events, connect with them on Facebook or Instagram, or reach out by email at csufeconassociation@gmail.com. For more on undergraduate and graduate academic programs in economics, or career opportunities in the field, visit the Department of Economics online or at SGMH 3313. Panel discussions, such as this Economic Policy Panel, give students insights into the academic and professional applications of economics.